The meter can instantly measure 7 different materials including Hard or Soft wood, Cement mortar, Lime mortar and Bricks. 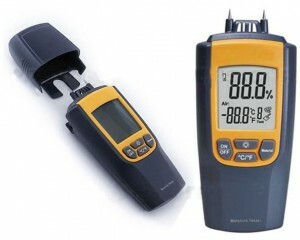 This moisture meter can simultaneously measure material moisture and air temperature. It has wide measuring range inmoisture from 0 to 95.7% and air temperature from -10 to 50 °C (14 to 122 °F) with high accuracy. The meter can instantly measure 7 different materials including Hard or Soft wood, Cement mortar, Lime mortar and Bricks. It is also featured with auto range and manual material selection, Dual level LCD display with Backlight, temperature selection of °C and °F. This meter can measure moisture of wood and building materials. It is a useful tool for engineering projects, floor mechanic and DIY purposes. – ขนาด : 121 x 60 x 30 มม.